This parrot food is specifically designed to fit the nutritional requirements of specific pet bird species, and others with special needs. (Select your size above, buy in bulk and save). 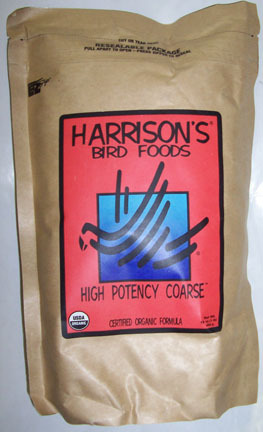 High potency coarse is certified organic pelleted bird food nuggets specifically formulated for the prime nutritional requirements of our pet parrots. those with special needs, (such as shown below). • as a year round formula for African greys, large macaws, Queen of Bavaria conures and other medium to large parrots. Buy in Bulk and Save: Select the variety you need above.